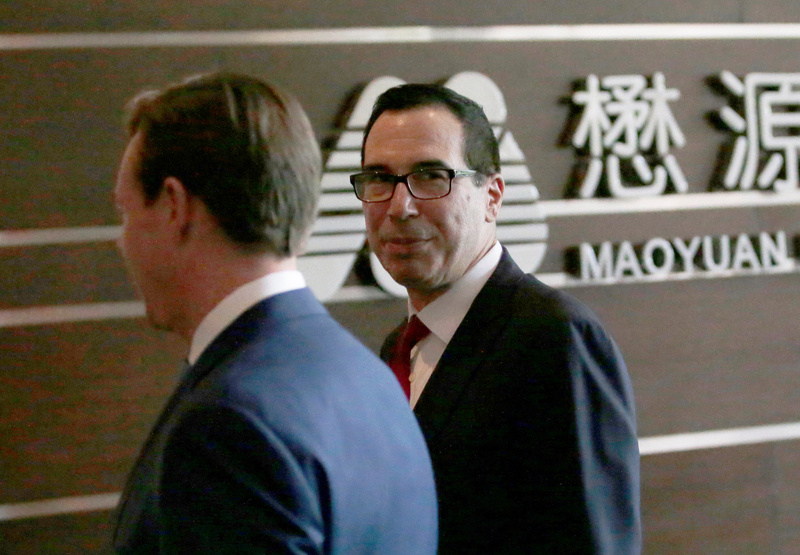 U.S. Treasury Secretary Steven Mnuchin (R) is seen as he and a U.S. delegation for trade talks with China arrive at a hotel in Beijing, China May 3, 2018. U.S. Treasury Secretary Steven Mnuchin arrived in China on May 3 for trade talks with his Chinese counterparts led by Vice Premier Liu He. The United States’ trade deficit in goods and services fell to $49 billion in March from $57.7 billion in February, according to Census Bureau data released on May 3. The export of goods increased by $3.7 billion to $141 billion, of which more than half the increase came from capital goods such as aircraft. Imports of goods decreased by the same amount to $210 billion in March. On a seasonally adjusted so-called census basis, which uses data collected by customs authorities, the goods deficit with China increased slightly to $35.4 billion in March, bringing the first-quarter total to $106 billion. That compares with $91.6 billion for the same period a year earlier. President Donald Trump has demanded a $100 billion annual reduction in the U.S. goods trade deficit with China, which totaled $375 billion in 2017.